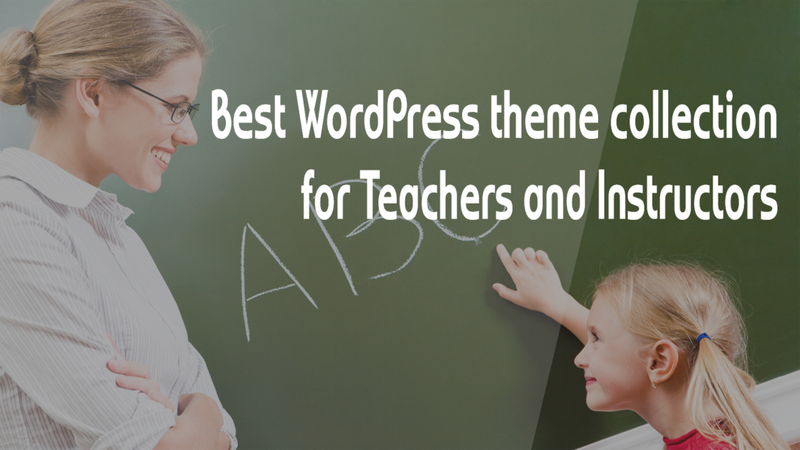 Listed below is the collection of education-related WP theme for teachers and instructors. Malcomn X, a famous African-American human rights activist, once said “Education is our passport to the future”. Nobody can object to the importance of education, especially in modern days when the speed of technology development keeps rocketing, expanding the horizon of knowledge is an essential need of any living standard. There is nothing wrong with making money from fundamental human needs and wants; therefore, education quickly becomes a potential valued industry. There is a variety of forms of studying and teaching come up to attract learners. These days, due to massive benefits and convenience that outweigh traditional teaching method, people invest million dollars on online education and courses. Owning a brilliant website is one of the wise choices for those who want to stand out in the market. Among several of platforms, WordPress seems to be the most popular with different features which help you control your site easier. 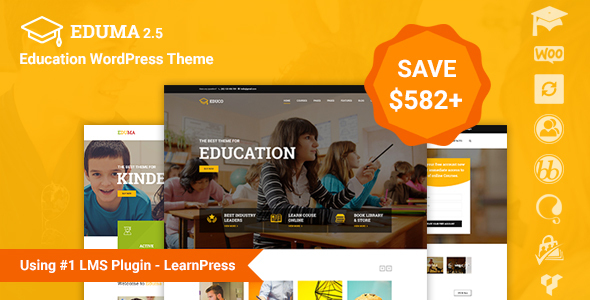 Getting the highest sales among ThimPress WP themes on themeforest.net, this is the strongest evidence to prove that Education WP is one of the most excellent suits you can wear for your site. Once installing the theme in only 1 click, your page immediately turns to a real Learning Management System with many convenient features for any educational projects or individuals. This is considered an updated version of eLearning WP theme which is in favorite theme list of numerous organizations with better UI and UX. It is not necessary to knowing any line of coding; you still feel it extremely easy to get on well with Education WP. One of the most outstanding characteristics about this theme is the library of over 10 demo layouts, different design for each. Visitors would love to see new things and always be curious to back to your site again to find “What’s it like today?”. Cool, huh? Another amazing feature of Education WP is a $500+ pack of impressive add-ons. If you want to open a course in a specific time? Content Drip will help you. Don’t want to introduce the same set of quizzes for different students? Let Random Quiz handle the matter for you. Amazingly, all these add-ons will cost you NO FEE when you choose Education WP. As mentioned before, this theme is a real LMS; that’s why it supports you in selling courses via various popular payment methods such as Paypal, Visa, Mastercard. Besides, the role of teachers and instructors here is the more important than ever with integrated bbPress to organize forums discussing about every lesson’s content with learners, improving interaction between them. It is worth taking a look and trying, isn’t it? If you search the keyword “educational wordpress theme” on themeforest, filter with Best seller, Kallyas would definitely show up in the very first row with nearly 22,000 sales. This is a multi-purpose theme with a huge demo collection to fit your every need. But hogash makes each of theme with care and perfection, especially for the Education demo. The theme color tone cooperated with the effects on the photos and the animations on other items displays a professional outlook for the site. You can also customize your site following your own idea, from editing the text till deciding whether which block stays where with drag and drop builder and over 100 pre-build elements. From the view of a visitor looking for a tutor or a course, Kallyas’s educational layout would impress them with the overview of the course the provider supplies and the portfolio of teachers which are all shown fully and spectacularly in the home page. Apart from the basic information of the course, like instructor, time and fee, hogash also support a schedule for learners to pick the most suitable time and content for them to apply, which is easier for the page-owner to control their information as well. You can experience by your own here. Another LMS WordPress them from ThimPress. This theme meets fundamental requirements of a perfect theme: 1-click installation in 10 minutes, responsive design, drag and drop page builder, parallax effect on picture items, etc. Yet Coaching WP equip for itself more “weapons” that surprises you. Beside 4+ dissimilar demo, Coaching WP has multiple header layouts for you to choose which one will fit with your career theme. In case you have a featured course and want to make it stand out in your page, this theme supplies you an attractive countdown clock and helps your learners access simpler to reserve “a seat” in your class. WooCommerce is also integrated in this stunning theme to give you a hand on selling your other products like books or teaching DVD. One of the most effective ways to take an impact on your demographics is to make them feel impressed about you. Splendid portfolio ThimPress made for this theme will accomplish the task. Elegance and professionalism in one – your image becomes trustworthy in your learners’ eyes. Approaching to knowledge has never been more straightforward than this! Building a website for nurseries or kindergartens seems to be quite challenging and Kidzy, a product of Themeum, might be the good solution. Kidzy is attractive right from the first look, with dynamic colors looking great on any devices. It promises to be suitable for your school or career related to preschool or elementary education. This theme supports 3 variations of home page. Especially, you are free to change the background image, background pattern and the color preset as well. The page’s layout is designed reasonably with blocks. They appear orderly while your visitor keeps scrolling to explore more about your school and your service. Class schedule, facilities, teachers’ portfolio, etc. All necessary information needed for parents who are looking for a tutor for their children are displayed significantly right from the home page. Moreover, Themeum does have a very smart step when putting the testimonial part in the theme so that you can use for parents saying about their satisfaction with your service. Your page could act as an online shop selling goods for kids, clothes, school bags for example. One click will send your wanted items straight to cart and checkout easily. Preschool still owns lots of amazement you should see for yourself! Teachers seeking for a site theme suitable for their desire of sharing their knowledge would love this well-prepared theme from Aislin. Skilled mainly focuses on creating and selling courses. Your site will turn to the second Udemy or Coursera that makes your learners fall in “love at first sight”. Skilled provides features to create online shop, show teachers and users’ profile as well. Based as a LMS theme, it integrates with a system to manage your course, questions and events. It also has a tracking system to let your learner know their progress . Therefore, they could plan to complete their study in suitable time with Sensei plugin. Sensei also includes a question bank, course analytics, quick user registration, etc. They are all ready for you to control your site effectively. Only one click, you not only install the theme but also are given a package of add-ons and plugins as a free gift: Visual Composer, Ultimate, Layer Slider, Timetable and many other more. Let your online training website to satisfy your learners and spread the knowledge around the world. ParkCollege is one of the best flat design WP themes in the market for education-related websites. Like others, this theme is designed in responsive so that your beautiful site always stays gorgeous no matter it displays on PC, iPad or iPhone. Unlimited color schemes in the theme options helps you to edit your page and decorate it in whatever way you want. ParkCollege is easy to config as well with block just to drag and drop as your wish without knowing how to code. Embedding video from Vimeo or Youtube is not complicated because it is supported also. An educational website’s most required feature is course manager, which is fully developed in ParkCollege. You are able to add, edit and remove any detail of the course. Users can approach the course list with no difficult due to smart search system via name, ID, program and even length. 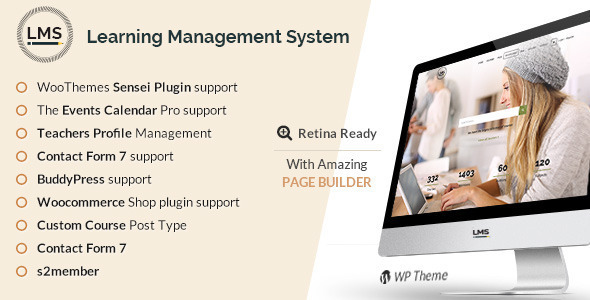 “POWERFUL LEARNING MANAGEMENT SYSTEM WORDPRESS THEME!” is what designtheme says about their product. As the name, this theme fulfills site-owner’s hope of an educational page with more than 3100 sales on themeforest. With cutting edge design and 6 demo, LMS can make your site become a beauty of art. Full width, boxed, left sidebar, right sidebar, both sidebar, etc., unlimited choices of layout are awaiting you. This theme’s option panel is very powerful with 4 different types of menu, editable typography and tons of settings. Furthermore, there are two options for your course: default and Sensei. With Sensei plugin, managing your coursework could be easier that you can create courses. You can also write your lessons and add quizzes from the quiz system. LMS also works well with many other plugins. For example: Contact Form 7 (help you to make a smart contact form), Events and Calenders (set event’s timetable, edit venue, organizer, etc. ), WooCommerce (sell your products and services).